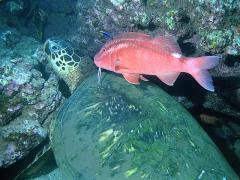 Estrelita, goatfish, and Hawaiian cleaner wrasse. We first met this turtle in 1992. We weren't as cautious back then about the possibility a juvenile could be a male, so we assigned the name Estrelita. In 1994, he showed up with a blatantly male tail--oops! Here he is being watched by a large red goatfish that hung around the Turtle House all summer in 1994, and who seemed to have a liking for turtles. We have seen it resting on the shells of various turtles on several occasions.